Decimus: "Human filth. Do you know what you have cost me? My salvage operation, the portals." — Decimus and Jerome after the latter destroyed the Banished portal network on Installation 00. 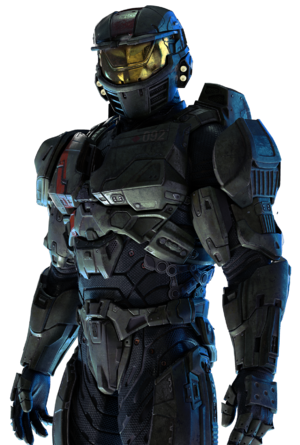 Commander Jerome-092, born Jerome Cable, is a Spartan-II supersoldier of the UNSC Naval Special Warfare Command. In 2531, he served as the leader of Red Team and fought alongside the crew of UNSC Spirit of Fire. Jerome Cable was born on May 8, 2511 to a poor family in the infamous Palaikos borderlands, an undeveloped portion of the human Inner Colony of Minister, a tough world that forced him into an early childhood of crime where he also realized his capacity for violence. He was of a genetic make-up that Doctor Catherine Halsey regarded as desirable for the SPARTAN-II program. After being selected as a suitable candidate for the SPARTAN-II program in 2517, he was abducted and sent to Reach, where he was specially trained to be a soldier by Chief Petty Officer Franklin Mendez and the artificial intelligence construct Déja. Although he initially attempted to escape from his training facilities several times, Jerome soon transformed from a self-centered survivalist to a competent leader, honing the speed and agility that kept him alive back on Minister. Jerome quickly proved himself to be one of the program's top candidates. Both Dr. Halsey and CPO Mendez identified him as one of the four emerging leaders of the group, along with Kurt-051, Fred-104, and John-117. In 2525, he and the other candidates underwent a series of augmentations to improve their physical and mental abilities. Jerome was one of a number of "washouts" whose bodies initially rejected the augmentations, but he was able to be retrained and re-augmented separately. During the process, he was partnered with fellow augmentation washouts Alice-130 and Douglas-042, with the three being organized into an incarnation of Red Team with Jerome as a team leader. Captain Cutter, Sergeant Forge, and Jerome-092 discuss how to proceed after Professor Anders' abduction. Jerome was the leader of Spartan Red Team during the Battle for Arcadia. On February 9, 2531, Jerome and Red Team were tasked with stopping the Covenant long enough to evacuate the civilians of the planet. Afterward, he and Red Team linked up with forces from the UNSC Spirit of Fire and assisted in a counterattack on a Covenant outpost. Once the plan to infiltrate a large Covenant shield dome was passed down from Captain James Cutter, he and Red Team remained with the crew to assist with the assignment. He helped prevent the destruction of several prototype M145D Rhinos while the tanks ensured that the shield was destroyed. After Sergeant John Forge's forces triumphed over a Scarab, Jerome, Douglas-042, and Alice-130 searched for Covenant survivors in the jungles on an M12 Warthog. Upon hearing that Professor Ellen Anders had been abducted by Arbiter Ripa 'Moramee, Forge and Red Team boarded Spirit of Fire, which jumped into slipspace in pursuit of the Covenant ship carrying Anders. Jerome-092 fighting on the Apex. "Good luck, sir. It's been an honor." — Jerome-092 to John Forge. Upon arriving at the Etran Harborage on February 23rd, Jerome assisted the Spirit of Fire's crew in neutralizing Covenant and Flood forces. Once Jerome assisted in destroying a proto-Gravemind, he and Red Team became stranded on the surface of the shield world. With the Spirit of Fire being dragged inside the megastructure, Red Team was assisted by Sergeant Forge and his forces and successfully withdrew to the ship. Red Team then assisted the crew in scouring the Flood forces from the hull of the Spirit of Fire. Soon, the crew repelled Covenant boarders and successfully repaired the ship's power core when after it was damaged by Covenant forces. Once Anders was rescued, Jerome was tasked with ensuring that the Spirit of Fire's slipspace drive arrived at the teleporter that would take it to the Apex Site in an attempt to destroy the shield world's sun, denying the Covenant access to a fleet of Forerunner warships. Atop the Apex Site, Jerome, Alice and Douglas engaged a large force of Stealth Sangheili while Forge engaged 'Moramee. Once the area was clear, Jerome volunteered to take the damaged drive in and ensure its detonation. Forge, believing that the SPARTANs would play a bigger part in the war than he ever could, took his place. Jerome, Douglas, Alice, and the Spirit of Fire's crew were then charged with opening the gate which allowed the Spirit of Fire to exit the shield world. Red Team returned to the Spirit of Fire before slipspace drive detonated and, after the Spirit of Fire escaped the destruction of the shield world, Jerome, as with the rest of the crew, entered cryo-sleep. The loss of contact prompted the UNSC to conduct a search of the vessel for the next three years, and eventually, in 2534, declared the Spirit of Fire "lost with all hands". Thus, Jerome was declared MIA. On January 1, 2537, six years after the events on the Etran Harborage, a Flood outbreak was initiated aboard the Spirit of Fire by a Pod infector that had managed to remain hidden aboard the ship. As the Flood threatened to breach quarantine, Serina awoke Jerome, who, with the aid of Professor Ellen Anders, was forced to exterminate all infected crew members, ensuring the survival of the Spirit and its remaining crew. After all traces of the Flood parasite aboard the Spirit of Fire were erased, Jerome returned to cryo-sleep. Alice: "Do we have a plan?" Jerome: "We do. Jerome to Spirit of Fire Actual...Sir. Requesting danger close. On our location, trailing north. Commence five seconds." In 2559, after 28 years of drifting in space, the UNSC Spirit of Fire found its way to the orbit of the Forerunner Installation 00, also known as the Ark. Awakened from the cryo-sleep, Jerome and the rest of Red Team were tasked with investigating a UNSC distress signal coming from the surface of the Ark. There, inside the abandoned UNSC outpost they encountered Isabel, a logistics AI, who warned the Spartans about a grave danger. Jerome extracted Isabel and Red Team continued investigating the outpost. However, they were soon ambushed by the Jiralhanae warlord Atriox, the leader of a mercenary organization known as the Banished: Atriox defeated the Spartans, severely wounding Douglas by crushing his left shoulder. Red Team was forced to retreat, and Atriox ordered his troops to hunt them down and capture them, in order to learn where they came from. It was not long before the team was in a Warthog and being pursued by Ghosts. In order to escape the pursuers, Jerome requested an orbital bombardment from the Spirit of Fire on their location. Reaching the landing zone, Alice decided to stay back and provide cover for Jerome and Douglas' safe evacuation to the Spirit. Cpt. Cutter and Jerome briefed by Isabel. Aboard Spirit of Fire Jerome and Cpt. Cutter were briefed by Isabel on events that had occurred on the Ark, as well as on strength of their enemy. Soon after, Jerome was tasked with running an assault on Banished salvage operations. Strike One, a unit of eight Marines led by Jerome, cut through enemy lines, capturing and destroying the Banished bases on their way while evading bombardment by the energy projector of the Enduring Conviction, the Banished's CAS-class assault carrier. Their main target was Decimus, Atriox's right hand, who led the salvage operation. Once cornered, Decimus managed to escape via portal network. In the ruins of Decimus' base Strike One recovered an encrypted piece of data, which pointed to the Ark's Cartographer. After that Jerome led a small, experienced unit of Marines on a mission to capture and access Forerunner Control Towers so that Anders could activate the Cartographer's elevator. On their way they discovered that the Ark's sentinels were not fond of Banished presence and destroyed their mining equipment. After eliminating all Banished forces around the Control Towers and capturing them, Anders was able to gain access to the elevator and transport the Marines up to the Cartographer. After reaching the Cartographer, the UNSC forces discovered an energy shield was preventing them from accessing the central chamber and the map room. Moving up, Jerome and the Marines attempted to take down the shield. Before they could, however, the Ark's self-preservation protocol sent sentinels, forcing the Marines to retreat. Fortunately for the UNSC, EMP devices were launched down from the Spirit of Fire onto the sentinels, successfully neutralizing them and allowing Jerome and the Marines to disable all of the conduits powering the shield. Accessing the Cartographer's data, Anders discovered that the Banished were using the Ark's network of thousands of portals to move around and reported her findings to Captain Cutter. Intending to cripple the Banished's portal network and strand most of their forces, Cutter deployed Jerome and a handful of the Marines near the network's control hub with orders to destroy it. As they advanced on the hub, the Marines destroyed portals along the way to prevent being overrun and discovered that the control hub was guarded by Decimus. On this mission Jerome was joined by Douglas, who had just recovered from his injuries, and together they successfully terminated Decimus and destroyed the device. Once the unit was informed that the Spirit of Fire was under attack, they had to return to the ship immediately. Jerome storming the Enduring Conviction. Soon after Red Team participated in a mission developed by Isabel to destroy the enemy's flagship, Enduring Conviction. According to the plan, Douglas and his team had to capture a Forerunner particle cannon, which the UNSC would use against the carrier, immobilizing it and disabling its shields, allowing Jerome and Isabel to infiltrate the carrier through its gravity lift while Alice and her artillery units cleared out a Banished base around the lift. However, en route to their destination, Jerome's Pelican was shot down. Jerome and Isabel managed to survive the crash and soon they rendezvoused with a sniper team led by Sgt. Allieri. Reaching the Banished base below the carrier, Jerome noted that the grav-lift was guarded by the anti-air turrets and requested Alice's assistance in dealing with them. Alice positioned her Kodiaks on the edge of the cliff near the platform and ordered them to fire on the Banished ordnance. Once the particle cannon finally managed to break through the Enduring Conviction's shields, Jerome was notified that he was clear to board and all remaining UNSC personnel underneath the carrier were extracted immediately. Arriving inside the carrier, Jerome made short work of the Sangheili in the area before inserting Isabel into a nearby holotank, allowing her to access the vessel's firing systems. Once Isabel managed to fire its ventral beam on the surface of the Ark, the installation's sentinels, in a desperate attempt to stop the destruction, launched themselves at the weakest part of the carrier. As the sentinels cut away at the vessel, Jerome held off Jiralhanae reinforcements, protecting Isabel. With the sentinels having done enough destruction to the carrier, the energy projector shut down and the front section of the vessel began to separate. Retrieving Isabel from the holotank, Jerome proceeded to jump out of the newly-formed opening, dodging debris as he descended toward the Ark's surface. Jerome on the surface of Installation 09. Once the Enduring Conviction had been destroyed and a new Halo ring emerged from the Ark's Foundry, Jerome was ordered to lead an offensive operation against the Banished on the Halo in order to beat them to the control room. Jerome was joined by Douglas and Alice, who just prevented the arrival of additional Banished reinforcements. A reunited Red Team led Marine forces to Alpha Base and defeated the Banished forces there. As the battle proceeded, a Retriever Sentinel suddenly appeared, wreaking havoc on the UNSC forces before the Marines could send it into retreat. After Red Team secured three Control Towers, Prof. Ellen Anders managed to take control of the massive sentinel and use its main weapon to gain access to the control room. As the professor descended to the control room, the Spartans and Marines stayed behind to defend the structure. With support from the Spirit of Fire, Red Team and Marines held back heavy Banished reinforcements long enough for Anders to disable the Halo's weapons systems and plant a distress beacon to the UNSC. After the Banished forces on the ring had been dealt with, Red Team evacuated to the Spirit of Fire immediately before the Halo entered slipspace and departed for the Soell system. Jerome continued to serve during the Spirit of Fire crew's ongoing fight against the Banished. At Isabel's insistence to better align the ship's impromptu command structure with the regulations of the UNSC at large, Jerome, then a senior chief petty officer like his teammates, was conferred the acting rank of commander by Captain Cutter. Jerome is regarded as an inspirational and highly competent leader. However, some aspects of his Spartan-II conditioning are in conflict with his strategic instincts, one of those being a preference for direct action. Like the other members of Red Team, Jerome-092 is equipped with the Mark IV MJOLNIR Powered Assault Armor. Jerome's armor is emblazoned with red markings and an emblem of a Corinthian helmet, known for its use by the ancient Greek Spartans, on his right shoulder pauldron. Jerome would frequently use a M6 Spartan Laser and M90 shotgun in battle, with a M6C magnum as a sidearm. Over the course of the Second Ark Conflict in 2559, Jerome, Alice and Douglas, began receiving eclectic custom upgrades to their armor from various sources, resulting in all-new, unique permutations built for the requirements of each Spartan. Following his promotion to commander, Jerome began using a custom Hydra MLRS missile launcher and had a personalized backpack module added to his armor. He also operates a custom command variant of the HRUNTING/YGGDRASIL Mark IX Mantis walker, nicknamed Theseus. Exclusively keyed to Jerome's neural interface and fitted to complement his augmented physiology and leadership style, Theseus is functions as his mobile command post. It features a command-and-control nexus relay from the Spirit of Fire to enhance Jerome's situational awareness in the field, and is able to function as a backup for the UNSC battlenet in the event the ship is damaged or destroyed. In Halo Wars, Jerome was portrayed by Crispin Freeman in-game and Gideon Emery in cutscenes. In Halo Wars 2, Jerome was portrayed by Mark Deklin and Nik Doner. Jerome-092's name was inspired by the campaign lead of Halo Wars, Ensemble Studios' Jerome K. Jones. Some of the painted designs and decals on Jerome's armor vary between Halo Wars and Halo Wars 2. In Halo Wars, the red stripe on his right breastplate runs (from his perspective) diagonally from bottom right to top left, toward his chin. In Halo Wars 2, the stripe begins at the top-right corner of the breastplate, runs diagonally toward the bottom left, and extends all the way to the abdominal plating. Additionally, Jerome's left breastplate now features the number "092" next to a red diamond. Furthermore, Halo Wars depicts a faint Legendary symbol decal on Jerome's left bicep; this is not present in the sequel. On June 28, 2017, Commander Jerome-092 was added as a leader for Halo Wars 2 multiplayer. Jerome-092 Halo Wars concept art. Sergeant Forge and Red Team preparing to dismount Spirit's FTL. Red Team preparing to defend against a Covenant attack. Jerome-092 stands with the rest of Red Team. Jerome-02 kicking a Flood combat form in Something has Happened. Jerome destroys a Pod infector in a single punch. Concept art of Commander Jerome-092 for Halo Wars 2. Jerome models in the Halo Wars 2 Open Beta. A close-up of Jerome and Isabel in Halo Wars 2. Jerome in a split Conviction. Jerome and the rest of Red Team on Installation 09. Jerome and Marines boarding the Pelican. Blitz card of Jerome-092 in Halo Wars 2. Blitz card of Commander Jerome-092 and Theseus. Blitz card of Commander Jerome-092 and UNSC Marines. Commander Jerome-092 fighting Unggoy and Sangheili with his Hydra. Commander Jerome calling in Theseus. Another angle of Jerome and Theseus. Commander Jerome faces off against the Captain Cutter version of himself in Halo Wars 2 multiplayer. ↑ The in-game timeline states that Douglas-042 made the suggestion to destroy 'Moramee's vessel, that he fought Sergeant Forge over the suggestions, and that the two later bonded over meals. However, Red Team's leader, Jerome-092, clearly makes the suggestion in the game proper. Jerome is also the only Spartan seen to interact directly with Forge during the campaign. More importantly, Forge takes Jerome's place in the suicidal attempt to destroy the shield world's star, suggesting the camaraderie said to have developed between Forge and the Spartan in question.